Well this has not been the best week for the Wigley Household so far... We discovered on Sunday night that our air conditioning unit's drain line was clogged, causing a minor flood which got under our brand new floors in our bedroom. WHY OH WHY could this have not happened six months ago when we had the hideous carpet in there?!?!? At 2am on Sunday Night/Monday Morning, we got the idea to go and get kitty litter to pour all over the floors to draw the water out from under the flooring. (Want a funny visual? Imagine me and the hubs standing around in our PJ's and staring at piles of kitty litter all over our floor at 3am) We probably won't know how much damage was done for a couple of days. Oh, the joys of home ownership. Needless to say, I haven't been able to work on any projects this week. On to a happier note, I wanted to share our friends (in real life and the blog world) Katie and JM's beautiful home. Katie has a super cute blog where she shares details of planning her wedding, attending 10 other weddings, and remodeling her home... makes your head spin, right? 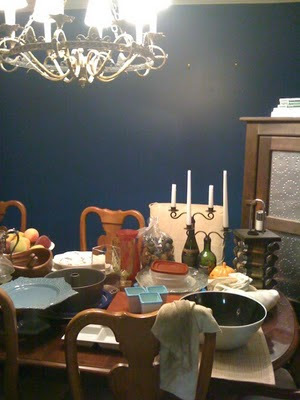 While Katie's fiance, JM was away for the weekend, she and her family did an OVERHAUL of their home. Before. Doesn't this room scream BACHELOR PAD!!! Its hard not to notice the GIANT Flag and Pool Table. AFTER... BEAUTIFUL Kitchen!!!! I am loving the new chandelier! AFTER... New Dining Room! Brighter, lighter, and makes the space seem so much bigger! AFTER... NEW Foyer.. SO much more inviting don't you think??? WOW! Can you believe she and her family did that in ONE weekend?! What a nice surprise for JM to come home to (hubs, don't get any ideas). Katie, thanks so much for letting me share these great projects! Hope you guys have a great rest of the week and please cross your fingers for my floors :) Talk soon, friends! Brandi, I am so honored that you posted my house!!! We are so happy with it! and yes JM was totally surprised! The wonderful Pie Safe is in the room still, you just cannot see it. It is to the right of the door into the dining room from the kitchen! Looks much more balanced over there!